Each race saw a different method to capturing a team title as North Central continued to show its utter dominance on the men’s side while a strong close by the women from Washington allowed them to chase down a perennial power. 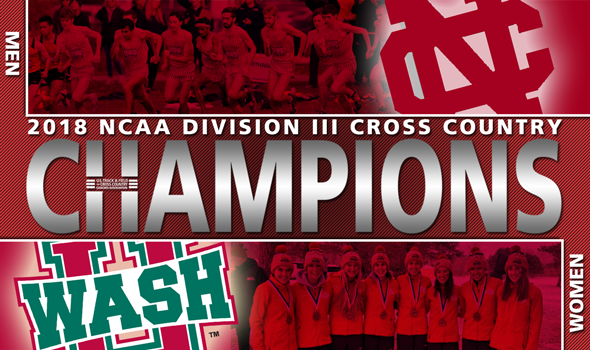 It was another dominating performance for one of the best programs to ever do it in collegiate cross country. North Central (Ill.) won its third consecutive NCAA DIII Men’s Cross Country National Championships on Saturday with 43 points, the lowest total a team has posted at the national meet since Calvin recorded 37 in its win in 2006. The Cardinals had the top-two finishers in champion Dhruvil Patel and runner up Al Baldonado. In total the group had four scored athletes in the top-11. The meet was never much in doubt for North Central as they held large leads at the 2,3K, 3K, 5K, 5.6K and 7.1K splits. Washington placed second with 110 points while UW-La Crosse took third with 127. Haverford rounded out the podium teams with a fourth-place finish after recording 213 points. After North Central’s top finishers, Andy Reischling of Omona-Pitzer, Josh Schrader of Wis.-La Crosse and Ian McVey of Ohio Northern completed the rest of the top-five individually. No. 2 Washington (Mo.) pulled the one-point upset and won the 2018 NCAA DIII Women’s Cross Country National Championships on Saturday. The Bears were led by meet champion Paige Lawler who became the first individual title winner in program history. The race was a battle at John Hopkins started off the race strong but Washington continued to give them a strong go of it. Johns Hopkins held the lead at the 3K mark by 113 points but Washington chipped away from that point on, shrinking the lead down to 16 points at the 5K split. The sprint to the finish line saw the Bears come in with the No. 1, 7, 13, 29 and 79 finishers while the Blue Jays took spots No. 6, 19, 22, 35 and 43. Molly Shepherd was the last Washington athlete to cross the finish line to seal the title. The win by Washington snapped a streak of two straight championships by John Hopkins, a run that included titles in five of the past six seasons. John Hopkins took second with 99 points and the rest of the podium was rounded out by No. 3 MIT (247 points) and UW-Eau Claire (265). As individuals, champion Lawler was followed by Otterbein’s Claire Lamb, Centre’s Annie Rodenfels, Coast Guard’s Kaitlyn Mooney and Brandeis’s Emily Bryson.